Lombard Street’s west end is at Presidio Boulevard inside The Presidio; it then heads east through the Cow Hollow neighborhood. For twelve blocks, between Broderick Street and Van Ness Avenue, it is an arterial roadthat is co-signed as U.S. Route 101. Lombard Street continues through the Russian Hill neighborhood and to the Telegraph Hill neighborhood. At Telegraph Hill it turns south, becoming Telegraph Hill Boulevard to Pioneer Park and Coit Tower. Lombard Street starts again at Winthrop Street and ends at The Embarcadero as a collector road. 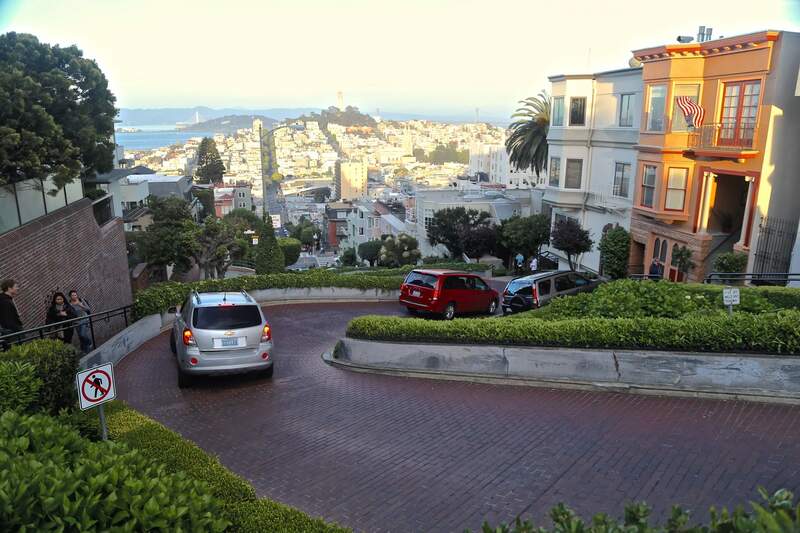 Lombard Street is known for the one-way block on Russian Hill between Hyde and Leavenworth Streets, where eight sharp turns are said to make it the most crooked street in the world. The design, first suggested by property owner Carl Henry and built in 1922, was intended to reduce the hill’s natural 27% grade, which was too steep for most vehicles. It is also a hazard to pedestrians, who are accustomed to shallow inclines, up to 4.86° because of wheel chair navigability concerns.